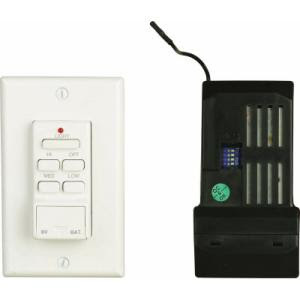 Question: Bought Lutron add-on remote controls for the ceiling fans with lights. Live in a 1 story townhouse. This seems like it will require re-wiring in the attic and wall as the fans are old. I want to be able to have the light on and not the fan and vice-versa. My wife wants dimmer capability too. I am pretty handy and have installed fans and switches and lights and such. Is this where we concede to the pro? Thanks for your opinion. Answer: Hi Scott,You should not need to rewire anything to add remote control units to your ceiling fan. All you do is install the receiver in between the feed coming out of the ceiling and the wires going to the fan. After you add the receiver your remote will be able dim the lights. Now since you live in a town house you have to watch the code you set your remote on. If you have a neighbor with the same remote and the same code they could control your light by accident. I received a call from a client in University city Philadelphia (19104) where a ceiling fan we installed was dimming for no reason. It turned out students move in next door and installed the same fan. We went back and put the fan onto a different code.